The Cage Saver Scrub Pad is an easy way to clean your feathered friend's bird cage.....will not damage the fine finish of your bird's cage. Cage Saver Scrub Pad is made from 100% split polypropylene and polyurethane fibers. Each scrub pad is approximately 5.25" x 3.25" x 1.5"
Cage Saver Scrub Pad5Kristen KeithAugust 23, 2015I purchased one of these pads over a year ago. 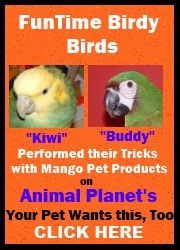 I have used the pad twice a day when cleaning my bird's cage, perches and grate. I rinse it when done and always spray vinegar on it to disinfect it. The pad has not scratched or rubbed off any of the powder coating. The pad has held up well and I am just now getting to the point that I need to purchase a new one. I read a review somewhere that a person used separate pads for perches, grates and cage bars and I think this is a good idea. I will definitely be purchasing more of these.